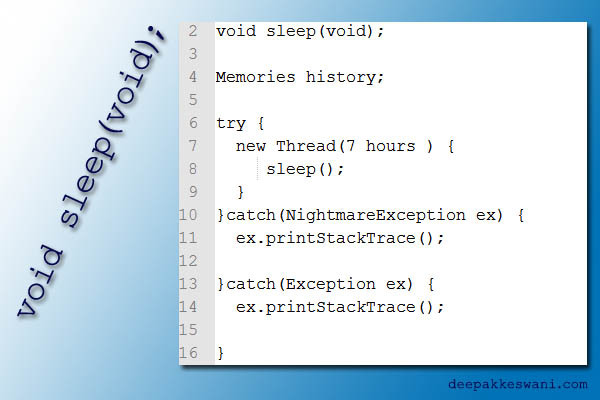 We have used sleep functions in many programming languages where we pass milliseconds as parameters. We control how long a thread to sleep with this. but sleep function in real life doesn’t take any parameters and returns only void. We execute this method by setting up a alarm clock which can be related to thead class with time parameter. Once the thread cycle is over, even if sleep function has not completed the job, we wake up and continue our tasks. Sleep function has direct access to our memories and forms a dream mixing memories with some expressions. Sometimes the dream operations of sleep function cause an abrupt ending which is captured by our exceptional handling mechanism. That’s how we remember what was going on while we were sleeping, otherwise most of the sleep operations are call by value. Actually caller of sleep function doesn’t pass any parameter and will not receive any response. I’ve been trying so hard to pass parameters of specific incidences and feelings so that my dreams are formed as per my wish, but every time I’ve failed.